Ugo Vicenzi reports back from Russia's annual ARMY exhibition, covering the latest military aircraft and airshow at the event's 'Air Force Cluster' at Kubinka air base, including the recently launched MiG-35 and new Su-30SM and MiG-29K of the Russian Navy. 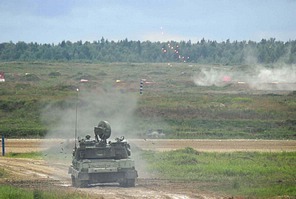 Organized by the Ministry of Defence of the Russian Federation, the International Military-Technical Forum “ARMY” is a yearly event showcasing Russia’s military with participation of Russia’s military industrial complex and foreign companies. The third edition “ARMY-2017” was held from August 22nd to 27th. The event is divided over three separate areas: the forum’s trade exhibition and conference takes place at the Patriot Congress and Exhibition Centre (also known as Patriot Park), demonstrations are held on the Alabino Military Training Grounds and at the airfield of Kubinka air base, all of which are located around 70km west of Moscow. Patriot Park is a military themed park presenting equipment of the Russian military forces, it was opened in 2016 and incorporates the Aviation Museum of Kubinka air base and the Kubinka Tank Museum. Alabino is a military proving ground where live-firing displays are held by ground and air forces, it hosts large tribunes for the dignitaries and during the annual forum for the public to witness real fire displays. Kubinka is a famous base of the Russian Air Force that is home to the two main aerobatic teams, Strizhy (“Swifts”) and Russkiye-Vityazi (“Russian Knights”), as well as the group engaged in Open Skies survey flights, one of the last employers of the An-30 turboprop. 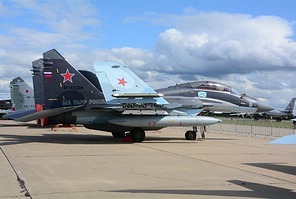 Most of the aircraft types employed by the Russian Forces were present in the static display at Kubinka, with some of the latest fighters such as MiG-29SMT, the shipborne MiG-29K and the new MiG-35; Su-30SM, Su-35S and the Sukhoi T-50 fifth generation fighter. Upgraded examples of the Su-25 and MiG-31 completed the fighter line-up. The tactical and strategic bombers were all present, Su-24M, Su-34, Tu-22M, Tu-95MS and the mighty Tu-160, or in Russian terminology, the “White Swan’. Other heavy types present included the Il-76TD airlifter, A-50U upgraded AEW&C aircraft, and the Il-38N maritime patrol aircraft. Also present in the transport/utility section were the An-12, An-26, An-140, An-148 and the Tu-134UBL bomber crew trainer. Rotary-wing types included the Ka-52, Mi-28N and Mi-35M attack helicopters, the upgraded Ka-27M Anti-Submarine Warfare helicopter; as well as the ANSAT-U light utility helicopter and the largest helicopter of all, the Mi-26. Basically, the only major absences from the Russian arsenal were the heavy transports from Antonov, the An-124 and An-22 that are soldiering on; Also, the Su-33 (Su-27K) was notably absent as it days are numbered with Russian Naval Aviation receiving new Su-30SM multi-role fighters for shore-based operations and the carrier-capable MiG-29K. One MiG-29K of the Russian Navy was present, the new multi-role naval fighter can be traced back to the late 1980s navalized MiG-29K but the modern design is based on the MiG-29M with HOTAS (hands-on-throttle-and-stick) controls, modern avionics and fire control system and radar, RVV-AE beyond visual range missiles, as well as anti-ship missiles. Russia is the second operator of the MiG-29K, the variant having been developed for the Indian Navy initially. Russia considered upgrading the carrier-based Su-33 fleet, but after continued development of the MiG-29K for India, it was finally ordered for the Russian Navy with deliveries starting in October 2016 to the 100th Independent Shipborne Fighter Aviation Regiment on board the carrier Admiral Kuznetsov, and taking part in the Russian air campaign in Syria from the Mediterranean Sea. Another modern MiG-29 presented was the improved MiG-29SMT, upgraded with the N-019ME (Zhuk-ME) radar, upgraded optical electronic fire control & navigation system with new data display system with multi-function colour display. The MiG-29SMT was first taken on strength when Algeria returned the jets due to quality concerns regarding the use of reworked components, while the Russian Air Force’s elderly MiG-29 fleet was dwindling due to fatigue related issues. The limited number of MiG-29SMT aircraft could not replace the entire “light” fighter fleet however. The most awaited new MiG-35, earlier presented at MAKS in July, was also present at ARMY-2017, but rather tucked away from public eyes inside a hangar, where it was accompanied by the equally secretive Sukhoi T-50 next generation fighter (PAK-FA), only towed in front of the public under an heavy tarpaulin. The MiG-35 is the latest 4th generation multi-role fighter from Russia, the new version has evolved from the MiG-29K/KUB and MiG-29M/M2 multi-role strike fighter version of the MiG-29. The MiG-35 offers improved flight performance, modern avionics, and is capable of deploying a wide range of air-to-air and air-to-surface weapons. Previously MiG-35 demonstrators were modified prototypes, but on 28 January 2017 the new MiG-35 was demonstrated to the Russian government. The MiG-35 has recently been ordered by the Russian State, with 30 aircraft for the Russian Air Force, while plans call for more to replace the entire ‘light’ fighter fleet. Fortunately, by staying awake between the few flying activities, it was possible to photograph the new MiG-35 pre-series aircraft “702” during a take-off. The current variants of the 'Flanker' were present, with the Su-27SM upgraded version, new Su-30SM two-seaters and the new Su-35S single-seat multi-role fighters. The multi-role Su-30SM based on Irkut’s Su-30MK has proven itself for the Russian Air Force in Syria and now equips the Russian Knights display team too, furthermore the Russian Navy also received the type to re-equip its shore-based units. The single-seat Su-35S “4++ generation” fighter was presented by the Falcons of Russia display team from the Lipetsk operational evaluation and conversion training centre, presenting a four-ship combat manoeuvring demonstration. The state-of-the-art 5th generation T-50 PAK-FA was like the MiG-35 only possible to see during a take-off, hence only belly shots are available. The T-50 is still announced to be in Russian Air Force service by 2018. At Kubinka things remained quiet most of the time, with only the occasional departures of the Mi-8AMTSh, Mi-28N and Ka-52 to the firing grounds at Alabino. The fixed-wing performances were mostly centred on Kubinka, with just occasional passages at Alabino. Aircraft flying displays consisted mostly of the aerobatic teams. Fresh from operations in Syria, the mighty Su-34 was one of the few active-duty combat aircraft participating in the air displays. A brand new Yak-130, with a full load of ordnance, was nicely displayed by a test pilot, performing an aggressive display. A smart black A-50U named ‘Vladimir Ivanov’ graced the static display. The A-50U is an upgraded Beriev A-50 AEW&C with new radar and avionics suit, and upgraded engines for increased maximum take-off weight and better range and mission time performance. The An-12 that was present, probably the oldest plane displayed, was a former An-12PPS stand-off ECM version. It is no longer equipped with the active jammer pods of the Siren-D system, but retains the distinctive rear tail fairing that housed the SPS-100 Reseda countermeasure jammer. 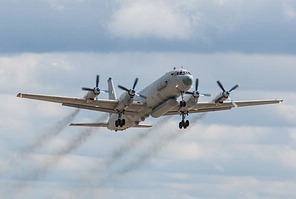 Two derivatives of the classic Ilyushin Il-18 airliner were present, an ageing Il-20M ELINT grey version in the operational area, and the upgraded Il-38N maritime patrol aircraft of the Russian Navy in the static line-up. The Il-38N upgrade is still in production, with recently five more aircraft ordered; like most of today’s MPA the Il-38N operations go beyond the ASW mission, with ELINT and SIGINT roles having been added. The An-140, originally designed as regional airliner, was ordered by the Russian Air Force thanks to the fact that it can operate from unprepared airstrips. Another quasi-airliner is the An-148, operated in the VIP passenger role with up to 62 seats, the An-148-100E version operated by the Russian Air Force has an impressive range of 4,400 km. There was also an old Tupolev jetliner in the shape of the Tu-134UBL, named ‘Meshchera’, a crew trainer for the Tu-160 strategic bomber. The 5 meters radome on the extended nose houses the same radar as the 'Blackjack'. Other oldies were the five An-30 operated on 'Open Skies' missions under the '2002 Open Skies Treaty'. The An-30 is a derivative of the An-24, with a glass nose and super-elevated crew cabin to allow for aerial photography; another derivative of the An-24 was the regular An-26 light military transport. The large bombers and airlifters remained parked all the time, not participating in the flying displays. The rotary-wing section consisted among others of the current attack helicopters, among them the Mi-35M, the latest variant of the well-known Mi-24 ‘Hind’. The Mi-35M incorporates several improvements over the Mi-24V/Mi-35, including shortened stub wings, a new rotor system, upgraded engines, and fixed landing gear to lighten and simplify the design and ease maintenance. It has a 'glass' cockpit, night vision goggle (NVG) compatibility, multi-functional displays (MFDs), redundant flight controls and modern avionics. The Mi-8AMTSh is an armoured assault version of the Mi-8AMT helicopter, capable of transporting up to 26 troops and the Combat SAR role. The two stub-wings can carry various types of weapons such as the Igla-V (SA-18) missile for self-defence, Shturm-V (AT-6) or Ataka-V (AT-9) anti-tank missiles, or unguided rockets. The Mi-28N attack helicopter is a dedicated battlefield helicopter, without secondary transport capability and therefore better optimized than the Mi-24/35 for the pure attack role as was displayed at the Alabino grounds. The Berkuty display team also presented its helicopter display routine with four Mi-28N. The Kamov Ka-52 ‘Alligator’ attack helicopter also performs target acquisition and designation for helicopter teams and to ground command and control centres. Its missions also include providing fire support for troop insertions and escorting military convoys. The two-seat cockpit can be flown by either pilot, its co-axial rotors make the helicopter extremely manoeuvrable. 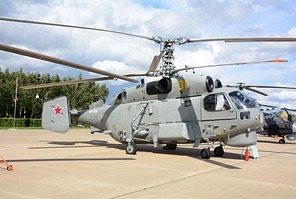 Other Kamov helicopter present was the anti-submarine Ka-27PL, currently in an upgrade process to Ka-27M with installation of Kopye-AA radar system. The Russkiye Vitazy team presented the new Su-30SM, with spectacular manoeuvres, including launching flares when appearing to be standing still in the air. The other Kubinka based team, the Strizhy, have now also received fresh aircraft, the MiG-29S, with also a revised colour scheme. The final aerobatic team, the Turkish Stars, was the only foreign participation to ARMY-2017. The Turkish team also brought their support A400M to Kubinka. There was a comparatively small public attendance at Kubinka, while the huge crowd around Patriot Park caused a massive gridlock. Families enjoyed the large amount of military hardware presented at the Park, as well as the interactive displays. But the people who wanted to savour some real Russian aviation were at Kubinka, despite a lot of rain and rather low activity in terms of flying, the Russian Forces were presented in a nice way.